Google just announced the major keys points of their next release. So far all we have with regard to the name is the placeholder "Android M." Will that be Marshmallow? Marzipan? M&M? Magneto? We don't know, but we do know what sort of features it will bring. There are six features in Android M.
App permissions - Apps will now ask for important permissions when they run instead of getting everything approved at installation. You can also go into the settings and modify the allowed permissions. Chrome custom tabs - Apps will be able to add custom Chrome tabs. This is not only for M, but some version of it is supported in Chrome Dev right now. We're still looking into this one. New intents - Apps on Android M will be able to verify link intents with the platform you you don't have to go through the app picker. It should be much faster. Android Pay - This is another feature that isn't explicitly for Android M—it works on 4.4 and higher. 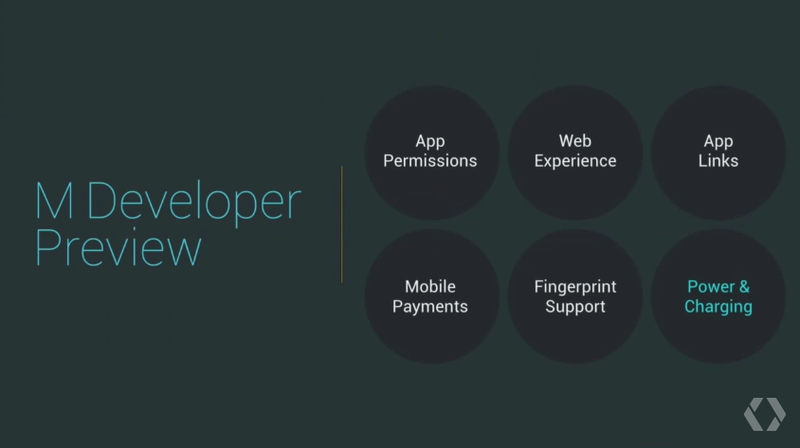 Fingerprint readers - Android M will have full support for fingerprint reader hardware. No word on nexus hardware that will support it. Low-power/doze - Google seems serious this time. Apparently apps on M will be able to ratchet down background activity when they haven't been active for a while, but still wake up for important events (like alarms). Android M will offer up to twice the battery life. There's also USB type-c support for both charging and it can act as charger for other devices. Google also said there are a lot of little things in M that will improve the experience like the new drop down menu for volumes or word selection will be better with word chunking. The sharing menu has direct access to your contacts too.